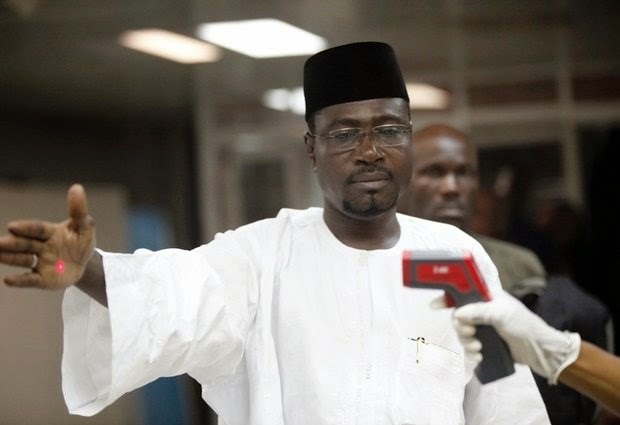 A Nigerian port health official uses a thermometer on a passenger at the arrivals hall of Murtala Muhammed International Airport in Lagos, Nigeria. The Obama administration’s plans to screen certain airline passengers for exposure to Ebola are based on the Constitution and long-established legal authority that would almost certainly stand up in court if challenged, public health experts say. Airline passengers arriving from three West African countries will face temperature checks using no-touch thermometers and other screening measures at five U.S. airports, starting with New York’s Kennedy International on Saturday. MONROVIA, LIBERIA (ASSOCIATED PRESS) — Liberian lawmakers on Friday rejected a proposal to grant President Ellen Johnson Sirleaf the power to further restrict movement and public gatherings and to confiscate property in the fight against Ebola. One legislator said such a law would have turned Liberia into a police state. The proposal's defeat came as the World Health Organization once again raised the death toll attributed to the Ebola outbreak. The Geneva-based U.N. agency said that 4,033 confirmed, probable or suspected Ebola deaths have now been recorded. All but nine of them were in the three worst-affected countries, Liberia, Sierra Leone and Guinea. Eight of the rest were in Nigeria, with one patient dying in the United States. On Friday, David Nabarro, the U.N. special envoy for Ebola, said the number of Ebola cases is probably doubling every three-to-four weeks and the response needs to be 20 times greater than it was at the beginning. He warned the U.N. General Assembly that without the mass mobilization of the world to support the affected countries in West Africa, "it will be impossible to get this disease quickly under control, and the world will have to live with the Ebola virus forever." Nabarro said the U.N. knows what needs to be done to catch up to and overtake Ebola's rapid advance "and together we're going to do it." "And our commitment to all of you is to achieve it within a matter of months — a few months," he said. The defeat of Sirleaf's proposal in the House of Representatives came as U.S. military forces worked on building a hospital for stricken health workers in Liberia, the country that has been hit hardest by the epidemic. "The House felt it was not necessary to grant her additional measures," Speaker Alex Tyler told The Associated Press. He spoke after lawmakers rejected the president's proposal to give her further power to restrict movement and public gatherings and the authority to appropriate property "without payment of any kind or any further judicial process" to combat Ebola. Liberia has recorded 2,316 deaths during the Ebola outbreak, according to the World Health Organization — more than any other country. Sirleaf's government imposed a three-month state of emergency beginning Aug. 6, but critics have accused the Nobel Peace Prize winner's approach to fighting Ebola since then as ineffective and heavy handed. "I see a kind of police state creeping in," lawmaker Bhofal Chambers, a one-time Sirleaf supporter, said before the vote. In August, a quarantine of Monrovia's largest shantytown sparked unrest and was derided as counterproductive before being lifted. The Committee to Protect Journalists has accused Sirleaf's government of trying to silence media outlets criticizing its conduct. Meanwhile, the U.S. military was rushing to set up a 25-bed hospital to treat health workers who may contract Ebola. Rear Adm. Scott Giberson, the acting U.S. Deputy Surgeon General, said the facility would be ready within weeks. "We're in training right now. As you may know, not everybody is fully experienced in seeing Ebola related care of patients," Giberson said. "We have experience deploying in lots of medical settings. However, this is unique." The arrival of 100 U.S. Marines on Thursday brings to just over 300 the total number of American troops in Liberia. The Marines and their aircraft will help with air transportation and ferrying of supplies, overcoming road congestion in Monrovia and bad roads outside the capital, said Capt. R. Carter Langston, spokesman for the U.S. mission. A priority will be transporting building materials to treatment unit sites. The U.S. has said it will oversee construction of 17 treatment units with 100 beds each. The 101st Airborne Division is expected to deploy 700 troops by late October. The U.S. may send up to 4,000 soldiers to help with the Ebola crisis, though officials have stressed that number could change depending on needs. In a call with reporters on Wednesday, USAID assistant administrator Nancy Lindborg said six treatment units were operational in Liberia. She said about 250 beds had come online in the last ten days or so, and that beds would come online in waves until the end of November. In Mali, a health ministry spokesman said two more people had begun participating in the first phase of a study for a possible Ebola vaccine. Mali has not had any cases of Ebola, but it borders the outbreak zone. University of Maryland researchers announced Thursday that the first study of a possible vaccine was underway, and that three health care workers in Mali had received the experimental shots developed by the U.S. government. "Today, we are at five people vaccinated," health ministry spokesman Markatie Daou said. "We envision vaccinating between 20 and 40 people for this first phase and the results are expected next month." Spanish Prime Minister Mariano Rajoy, meanwhile, visited the Madrid hospital where a nursing assistant infected with Ebola is being treated. Teresa Romero was scheduled to start receiving the experimental anti-Ebola drug ZMapp, which is in extremely short supply worldwide, a spokeswoman for Madrid's regional health agency said on condition of anonymity because of agency rules. Romero contracted Ebola in Madrid while helping treat a Spanish missionary who became infected in West Africa, and later died. She is the first person known outside of West Africa to have caught the disease in the current outbreak. Rajoy praised Spanish health care workers and said the World Health Organization thinks "the risk is very low that this disease will spread in the future" in Spain and Europe. __ Corey-Boulet reported from Abidjan, Ivory Coast. Associated Press journalists Wade Williams in Monrovia, Edith M. Lederer at the United Nations, Ciaran Giles in Madrid, and Baba Ahmed in Bamako, Mali, contributed to this report.